The highly anticipated summit on higher education organized by the provincial government began Monday morning, where Premier Pauline Marois clarified that the two-day conference would “establish an open dialogue” on post-secondary learning but would likely not reach a solution. Following a whirlwind provincial election, the Parti Québécois announced the summit in September in an effort to appease all sides in the student movement crisis that rocked Quebec for months last spring. The minority provincial government cancelled the tuition fee increase of $325 per year over five years, and later $245 over seven years, imposed by the Charest Liberals upon taking office, effectively freezing tuition for the time being. The conference was initially pegged to resolve the issues at the core of an ideological impasse over higher education. Heavily guarded by the Montreal police, guests had to pass through three checkpoints before entering Arsenal gallery on William St. in Griffintown. During the first day, Minister of Higher Education Pierre Duchesne offered three proposals in relation to post-secondary education: create a provincial council to oversee universities, a law that would provide a framework for universities and a plan to hold institutions accountable for financing and budgeting. In a meeting that lasted over 12 hours, multiple issues were discussed: the development of post-secondary funding, research, quality of education and accessibility. While various concerns were voiced by participants, the most contentious issue of the day was the issue of tuition. The PQ announced later in the evening that they plan to index university tuition at approximately three per cent annually, meaning that tuition will rise by $70 per year leaving student representatives feeling deceived. Martine Desjardins, president of the Fédération étudiante universitaire du Québec, said that indexation would “punish” students and send the wrong message. “I’m telling you there will be an impact,” said Desjardins. However, Duchesne said that the province can simply no longer afford the same rates and that a freeze would force Quebec into a crisis. Concordia University is waiting on the results of the provincial conference to know when the additional funding promised by the PQ is coming — something that was promised to the university in the wake of the tuition freeze. Peaceful protests marked the first day of the summit, with a small contingent gathering outside Arsenal gallery in the early morning during guest registration. Approximately 30 protesters passed through the streets of Griffintown calmly without ever accessing the highly guarded building. Similarly, a gathering of 20 demonstrators including professors, students and civilians congregated on Notre-Dame St. to reiterate their position on accessible education. The protesters did not mobilize, choosing instead to read poetry and sing in support of students in front of the building. In the afternoon more than 1,000 protesters marched through the streets of downtown Montreal, leaving from Cabot Square. The protest was promoted by the Association pour une solidarité syndicate étudiante, the student association that backed out of the conference since free education would not be part of the discussion. Del Grosso went on to say that those present didn’t want tuition to rise and genuinely believe free education is a possibility. Protesters headed south before arriving at the summit, where police officers from the Service de police de la Ville de Montréal and provincial police guarded the building. There was no intervention before demonstrators resumed their march east toward the downtown core. The protest, though declared as illegal from the start, was largely peaceful. 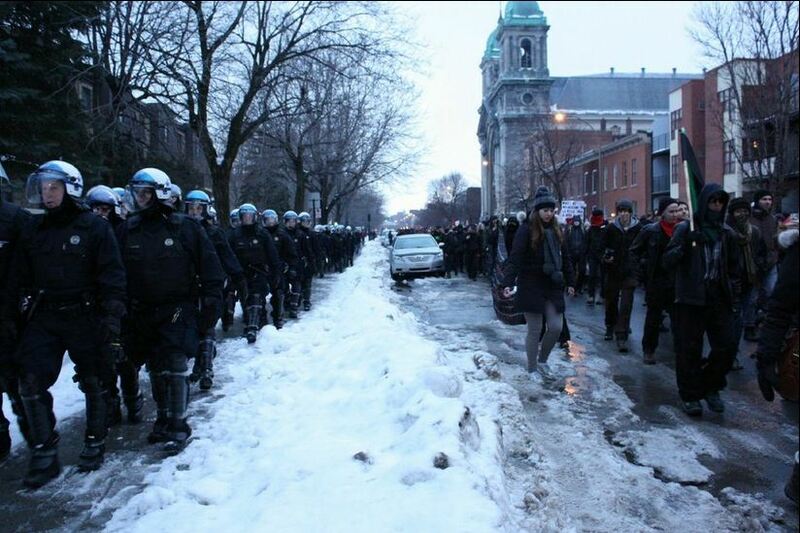 The SPVM reported two arrests. Police claimed that projectiles were launched and flags from some downtown hotels were removed by student protesters. By 6:30 p.m. protesters had made it to Ste-Catherine St. and McGill College St. but by 7 p.m. most of the protesters left after tear gas was deployed. Several demonstrators met at Parc Émilie-Gamelin heading east but dispersed close to Beaudry Metro station. Earlier Monday, several buildings were vandalized with red paint including the offices of Duchesne and of former student leader Léo Bureau-Blouin. The Ministry of Education building located on Fullum St. was also covered in red paint. Vandals wrote in white outside the offices of the minister responsible for Montreal, Jean-François Lisée, and several windows were also broken. No arrests have been made in relation to those incidents. With files from Robin Della Corte and Matthew Guité.